Megan Tomiko Ono is named First Princess; Miss Tomodachi is Julia Kiyomi Tani. Jaclyn Hidemi Tomita, a 24-year-old graduate of San Diego State University, was crowned Nisei Week Queen at the 76th annual Nisei Week Coronation on Saturday night at the Aratani Theatre in Little Tokyo. Tomita represents the San Fernando Valley Japanese American Community Center, where she played basketball with the San Fernando Athletics and even volunteered at the booths during Obon. “I was in shock at first and then an overwhelming sense of happiness,” Tomita said. VIDEO: Watch Jaclyn’s crowning moment. Tomita plans to attend nursing school and become a registered nurse. At SDSU, she served on the Nikkei Student Union executive board and was a participant in the Kakehashi Project, whose mission is to facilitate understanding between Japanese and Japanese Americans. She said she is looking forward to being an ambassador for the Japanese American community. The title of First Princess went to Megan Tomiko Ono, who is sponsored by the Orange County Nikkei Coordinating Council. Ono, 23, is a graduate of Cal State Long Beach and works as a facilitator for Kizuna’s youth programs. 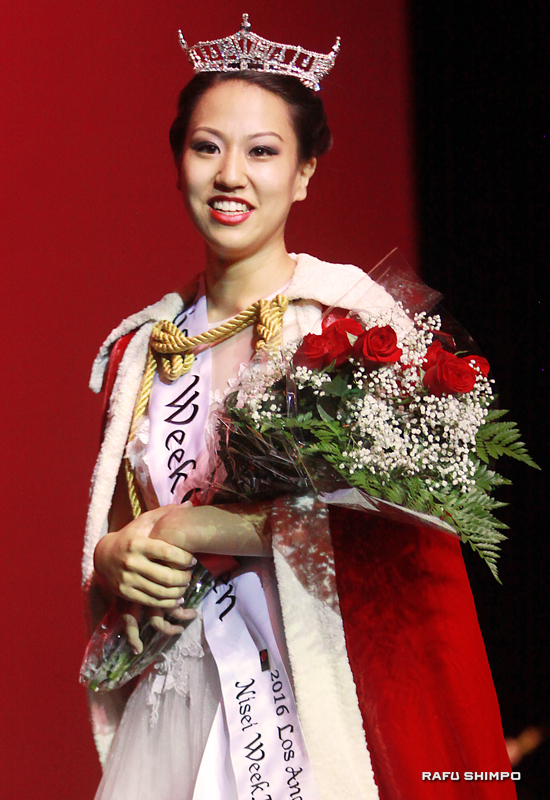 Julia Kiyomi Tani, representing the Pasadena Japanese Cultural Institute, was named Miss Tomodachi. Tani, 24, graduated from the California Maritime Academy and hopes to become a speech pathologist or special education teacher. April Leilani Nishinaka, 23, sponsored by Gardena Evening Optimist. 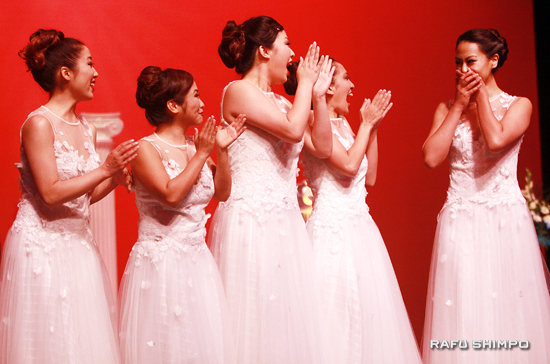 A full report of the coronation and other Nisei Week events will be in the Tuesday edition of The Rafu.